I have been such busy little lady this past week, I've completely neglected my little blog, but I am sure my couple of readers won't be too angry, hehe. Work as been keeping me extremely busy, from tons of new edits, to fixing old edits, I haven't had much time to think about anything else. I have so many projects going on currently that my 6 TB of hard drive space are almost all used up! I am still completely amazed that I could almost fill that amount of space. If I could go back in time I would tell myself to buy more hard drives when they were on sale, hehe. Thankfully today has been filled with renders, both my iMac and macbook are currently busy rendering and still have hours to go. One of my least favorite things about editing are the darn render times, it is astonishing how long it can take to render out a 15 min video with effects, especially when you just want to get the project done! But today I put my free time to some good use and baked a pie. If you have been reading my blog lately you have probably noticed I have been on a bit of a pie baking kick, but I mean pies are wonderfully delicious so why not, hehe! 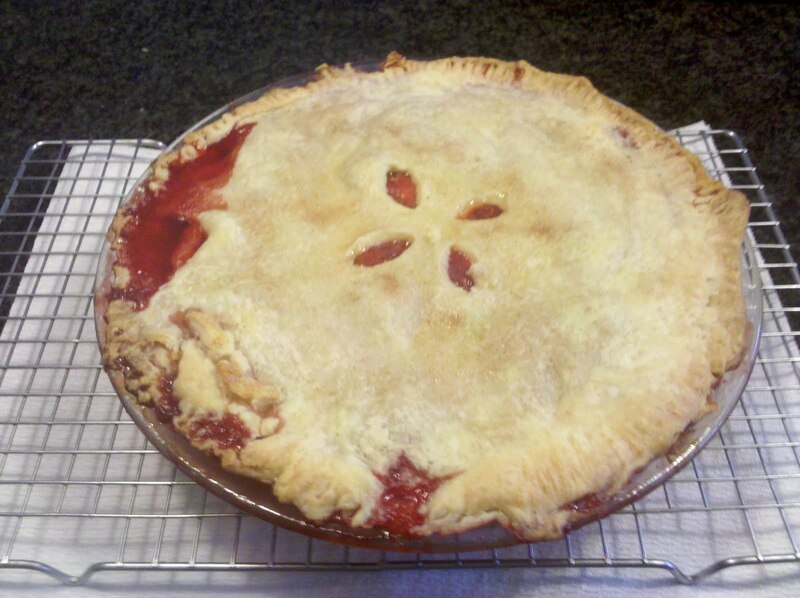 And we had some frozen strawberries I wanted to use, so a strawberry pie it was made! However I didn't let the strawberries defrost enough so it was slightly exploded with juice, haha! Sorry for the crappy cell phone picture, our Canon is currently being fixed. Hope everyone is having a happy Friday! Delish! Good luck with editing. 6TB is more than I've ever seen, ever! Oh, so delicious that looks! A job well done.